Richard Chaplow says he has never experienced anything close to Doncaster Rovers’ horrendous run of form. 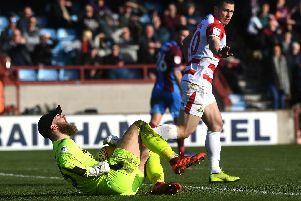 Defeat at Bury on Saturday stretched Rovers’ winless run to 16 league matches, leaving them eight points from safety with the finishing line in sight. And he admits the poor run and increasing pressure to win every game has taken its toll on the players. “I think there’s a lot of the lads that are down,” he said. “There’s a lot of frustration in the dressing room. “It’s 16 we’ve gone without winning which is incredible. “I’ve never known anything like it in my career. It’s been really tough. “The lads gave everything again and you couldn’t ask for much more on and off the ball in terms of workrate and creating chances. “It’s just that final bit if quality which is something we’ve been desperately missing in the final few games. “Whether that’s because we’ve maybe not got that clarity of mind you’d have on a winning run. We’re not being clinical enough in the final third and it’s costing us points. “If you’re winning games and the points are coming in, the chances we had are hitting the back of the net. Chaplow says Rovers have a duty to fight over the five remaining games and must quickly pick themselves up ahead of next weekend’s clash against a Wigan Athletic side destined to secure promotion to the Championship. He said: “We’ve got to pick ourselves back up. “We’ve got five games left to try to make something out of the rest of the season, muster something up and try to stay in this league.